· THIS IS NOT AN IMPORT, RECORD CLUB RELEASE OR A COUNTERFEIT PRESSING. · FAIRLY THICK VINYL PRESSING On the scale from 1 to 10 (1 being the least thick, and 10 being the thickest), we assess the thickness of the vinyl as 6. 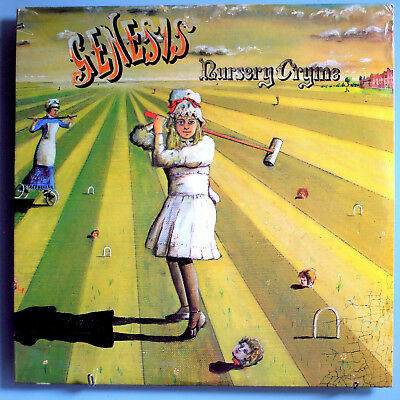 Genesis' first fully realized, mature album, Nursery Cryme, is still somewhat uneven, but the stuff that does work well works so well that it carries the record. This includes "The Musical Box," which became a highlight of the group's live shows, presenting 's extraordinary abilities as a singer/actor as well as hinting at a level of lyrical sophistication that dazzled many fans and onlookers. "Return of the Giant Hogweed" was an even better showcase for the group's playing. (a) THE ALBUM IS STILL FACTORY SEALED AND IS BELIEVED TO BE PERFECTLY MINT. Please note: sealed items are assumed to be mint and are sold as-is, as we have no way of inspecting them. For our policy on still sealed records ►. (c) The record is apparently pressed on a RELATIVELY thick, inflexible vinyl. This is NOT a thin, flimsy ('dynaflex' type), vinyl, but not the thickest, most rigid vinyl, either.